Also Called: Frostweed, ice-plant, tickweed. Stems: Erect, stout, finely pubescent, winged. Leaves: Alternate, ovate to lance-elliptic or lance-linear, 3 to 9 inches long, 1 to 4 inches wide; upper surface rough to nearly glabrous; lower surface soft-hairy or velvety; margins coarsely-toothed or nearly entire, sometimes wavy; tip pointed to long-pointed; sessile or base narrowed, stalk-like, extending partially down stem as wing. Inflorescences: Heads, 20-100+, 1 to 1.5 inch across, terminal, in open, somewhat flat-topped clusters; bracts 8-13 in 1-2 series, flattened, overlapping, spatulate to oblanceolate, hairy. 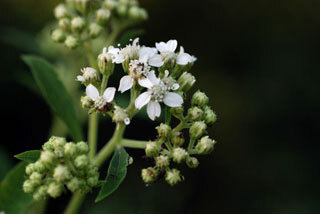 Flowers: Ray florets 1-5, 1/6 to 1/3 inch long, white, spreading to drooping; disk florets 8-15, corollas white or cream. Fruits: Achenes, oblanceolate, flat, dark-brown to black, sparsely pubescent, winged or wingless, tipped by 2 stiff, slender awns. At maturity, the achenes are arranged in a hemisphere. Habitat: Open wooded hillsides, woodland margins, openings in woodlands, flood plains, thickets, roadsides, stream banks, pastures; damp soils. Comments: The common name frostweed comes from the plant's behavior when there is a hard frost. The stem splits near the base and the sap that seeps out freezes in conspicuous ribbons of ice. Helianthemum bicknellii is another Kansas plant that goes by the common name "frostweed".